BEST MOTHER'S DAY IDEA! Lets celebrate our Moms! If your mom is audacious, courageous, gorgeous, hilarious, adventurous or fabulous, she deserves more than just flowers. 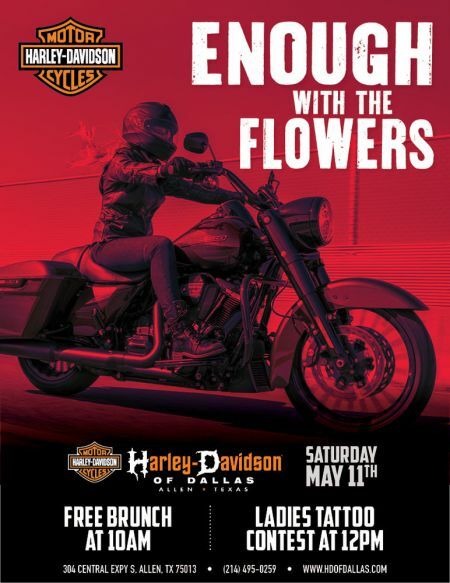 Bring her to Harley-Davidson® of Dallas in Allen Texas for the best Mother's Day ever. We will have Brunch at 10am, Gift Wrapping for Moms gift, raffle tickets will be given out all day. The prize will be a gift basket for mom! Ladies Tattoo contest! winner is $100.00 gift card! You must register with Amanda@hdofdallas.com to participate. Contest will start at 1pm, gift bag drawing @ 2pm. Must be present to win! Some restrictions may apply. Please see dealer for details. Gift Cards cannot be used toward new motorcycle purchases.